Region: This fly is found in the United States and southern Canada. Life cycle: This insect produces one generation each year and overwinters in the soil as a pupa. It merges from the soil in April or May and lays its eggs in the fruit. When the fruit drops, the maggots enter the soil. Physical Description: This fly is about the size of a housefly, 1/5 to 1/3 inch long. It is yellow to dark brown with dark bands on the wings. Its eggs are laid singly inside the fruit, and the larva is yellowish and ranges from 1/3 to 1/2 inch long. Feeding characteristics: This pest attacks the currant and gooseberry plants. 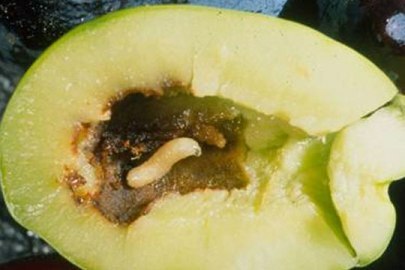 The maggots eat inside the developing fruits, causing them to turn red and prematurely fall from the tree. Controls: As soon as blossoms begin to wilt, dust with rotenone in two to three applications at weekly intervals.